✎ Trent Reznor’s Top 10 Rules For Success. He’s the founder and primary musician of the industrial rock project Nine Inch Nails. While assembling the earliest Nine Inch Nails recordings, he played all the instruments except drums. He won the Academy Award for Best Original Score for The Social Network. He has appeared in Time’s list of the most influential people. 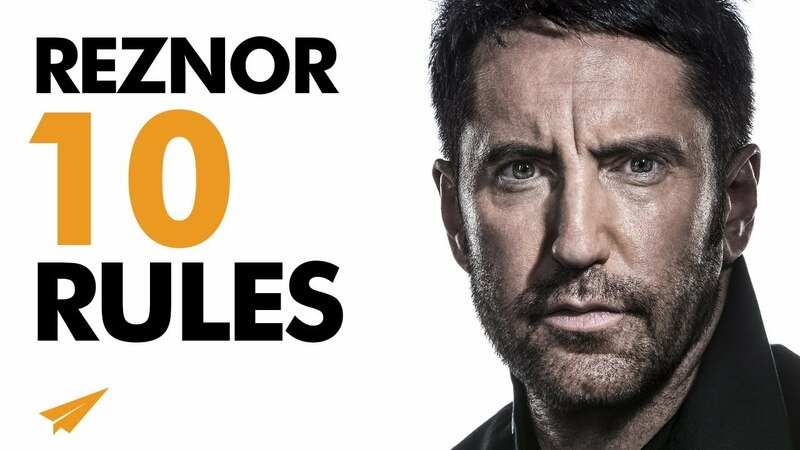 He’s Trent Reznor and here’s my take on his Top 10 Rules for Success. 1. what do you need to just go with your gut on? 2. where do you need to better express yourself? 3. what can you do to seek inspiration daily? ✎ More about Trent Reznor. He began playing the piano at the age of twelve and showed an early aptitude for music. At Mercer Area Junior/Senior High School, he learned to play the tenor saxophone and tuba. He was a member of both the jazz and marching band. Reznor joined local band Option 30 and played three shows a week with them. After a year of college, Reznor dropped out and moved to Cleveland, Ohio, to pursue a career in music. His first band in Cleveland was the Urge, a cover band. Reznor got a job at Cleveland’s Right Track Studio as an assistant engineer and janitor. One of Reznor’s earliest collaborations was a Ministry side project in 1990 under the name of 1000 Homo DJs. Reznor was in the David Bowie video for the song “I’m Afraid of Americans” in 1997. In 2006, Reznor played his first “solo” shows at Neil Young’s annual Bridge School Benefit.